“Last year wasn’t a failure, just a disappointment,” said Miami HEAT forward Chris Bosh, about the team’s loss to the Dallas Mavericks in the 2011 NBA Finals. 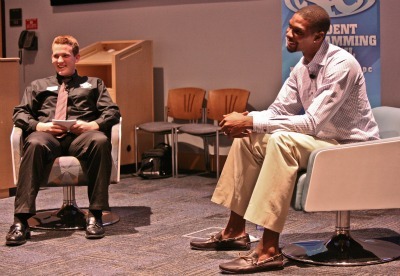 Bosh was speaking to an audience of more than 450 FIU students gathered Sept. 22 for a Q&A session with the six-time NBA All-Star. Michael Katzmayr, vice president of campus relations for the SPC, asks student-submitted questions to Chris Bosh. Photo by Kristi Camara. For an hour at the SIPA auditorium, Bosh spoke candidly about the hype that surrounded last season, as well as the challenges of growing up, on and off the court. Going into last year’s championship, the HEAT were heavy favorites with newly acquired stars Bosh and LeBron James along with returning star Dwyane Wade on the roster. But the Dallas Mavericks took top honors, becoming the first team in NBA history to enter Game 3 tied 1–1, lose Game 3 and still win the Finals. Bosh said the season was extremely hard, but also a lot of fun. He is using the loss to stay motivated, working harder than ever in the off-season. “Expect straight awesomeness this year,” he said. His parents both worked and the basketball star also credits after-school programs for keeping him out of trouble. “I went to a lot of free camps. I’m not sure I would be here without them,” he said. Today he helps kids through his eponymous foundation established in 2004.